We love nature. We love enjoying all that God created. We love studying it and being surrounded by it! Fiji has many interesting beasts, nothing large (except for the elusive wild boar which we have only seen cooking on the fire…not alive) and while I refrain for moral and ethical reasons 🙂 from taking pictures of spiders (okay, I actually did take a picture of a large one, but can’t find it), cockroaches (disgusting) and rats (extra disgusting), we love taking pictures of the different birds, bats and geckos! 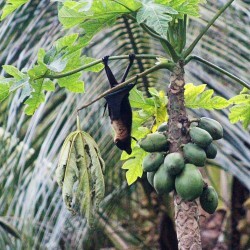 We have a small nature reserve in our backyard and each night the fruit bats descend upon it to eat breadfruit and papaya. It is so fun to sit with the binoculars and look at these magnificent creatures. There are several hundred that circle the skies above our house while we eat supper and a few who swoop down into the grove. The hawks had a nest in the grove as well and when the baby was little the mom would swoop people on the the road. Of course, our kids love this and we have read a lot about these great creatures! This was taken from our deck. The bat kept looking at us very curiously! 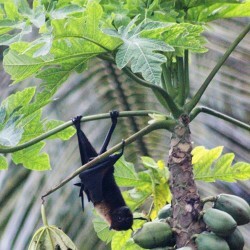 These bats are the largest in the world and are bigger than a large crow. We always enjoy how they use their wings like legs to walk along branches. 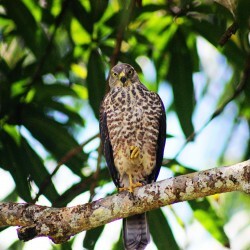 This beautiful juvenile Fiji Goshawk frequented our yard. He would come sit and stare at the kids…suspicious indeed (and our cat went missing shortly after!! For real)! He also joined one of our prayer times. He is now matured and has some beautiful grey feathers and we see him less frequently now that he is older!! This little gecko is affectionately named Sahil. He sits faithfully on our kitchen window and supervises all dishwashing. We have caught him and taken him outside many many times and he always turns up on the kitchen window again. He watches the cleanup and even helps sometimes by licking fruit juice off the counter. He is a faithful moth eater (no screens in the window means lots of moths at night however we have many geckos who do faithful cleanup). Beautiful pictures!! My kids would love the bats…and the hawk (actually I don’t know who would love them more, them or me!) I was just thinking about you guys tonight and praying for you and your family. God bless! Thanks so much Esther! We so appreciate the prayers!! Have a great day! Love hearing about your day-to-day lives on the other side of the world. Have a great day, Atkinson family! Thanks Esther! My boys would never let me put them in the ‘disgusting’ category!! There are too many other disgusting things!! Blessings!! Hey! the spiders… i could help with pics of those… the ones that were huge by Canadian standards, yet small to Fijians! haha!! wow- that was shocking! remember? Kathy was my faithful spider smacker? 🙂 anyway… i always found the bats fascinating, and huge, and Eric loves hearing about how big they are there. 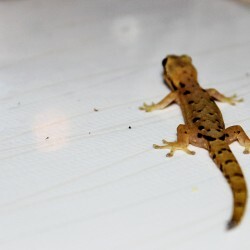 The gecko is Suva is different looking in coloring than the one in Savusavu… thats cool too! love the article! I also forgot about the mongoose! Poor guy!! we have a cute one with two babies in the backyard! !